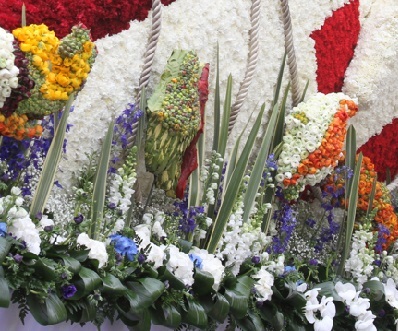 Book an exceptional weekend break to see the annual Corso Fiorito, the traditional Carnival flower parade in San Remo with the most wonderful flowers and fragrances, the most colorful floats, not to mention the liveliest musical bands. The Corso Fiorito in San Remo, held every year as part of San Remo in Flower, is broadcast live on RAI, but to experience it up close is so much more exciting! You can take part in all the fun by booking this package tour offered by Nyala Wonder Travel. Arrival in the afternoon and check-in at hotel. After dinner you have a free evening to try your luck at the gaming rooms of the San Remo Municipal Casino. Return to the hotel and overnight stay. In the morning transfer to the town of La Mortola to visit the Hanbury Botanic Gardens, where many exotic and rare species of plants have been cultivated in an amazing setting, with a period villa in the middle of an 18 hectare park that stretches right down to the sea. In the afternoon the next stop is at Bordighera, the City of Palms, to visit the Pallanca Exotic Garden, which has the most extensive Italian collection of cactuses, which are perfectly at home in the micro-climate of the Riviera of Flowers. In the morning, transfer to the center of San Remo to watch the traditional parade of the flower floats in the Corso Fiorito of San Remo from the comfort from the seats of the stands; you will marvel at the sequence of floats decorated with thousands of flowers of every color, full of intricate designs and incredible colors. It’s a day to live intensely, immersed in the most beautiful flowers and scents of the Riviera! You are free for lunch; departure in the afternoon. Accommodation in hotel with double room, half board. Lunch in a typical restaurant in San Remo. Round trip travel, transfers to locations indicated in the program, and anything that is not included in “our offer includes”. Lunches and dinners are to be chosen from the menu of the day or the sampling menu offered by the chef. A la carte drinks or plates are to be paid for on the spot. The suggested tours in the program are to be considered as free, i.e. without the services of a guide.